Description: The Rabbis' King-Parables: Midrash From the Third-Century Roman Empire, shows the ancient Rabbis at work in different ways and with different purposes, but always with the same tools, parables of kings. As it attends in detail to the king-parables' form, structure, functions, settings and characters, it emphasizes the Rabbis' distinctive ideas about the relationship of humanity to God, and it engages with studies by scholars such as David Stern, Daniel Boyarin, Martin Goodman and Clemens Thoma and with the method of dating rabbinic material advocated by Jacob Neusner. It considers the parables as resistance literature in light of the work of theorists of dominated groups, and it is the first systematic attempt to read the parables as sources for Roman history in over 100 years. 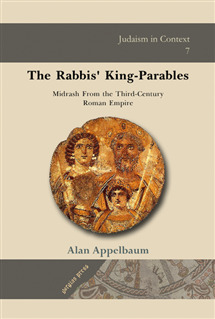 Citation: Rachel Adelman, review of Alan Appelbaum, The Rabbis' King-Parables: Midrash from the Third-Century Roman Empire, Review of Biblical Literature [http://www.bookreviews.org] (2014).